Here we have a first shot of the Anakin Skywalker figure. 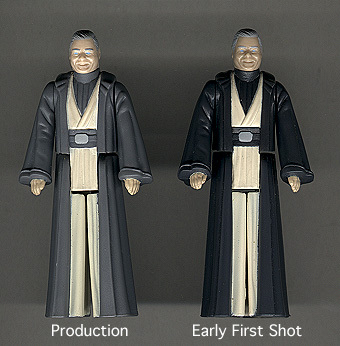 Although it's hard to tell from this image, the figure is a great deal darker in color than is the production version. Like most first shots, it lacks the date and copyright information from the back of its leg. This comparison shot should give you an idea of how different in color this piece is from the production figure.